Schwinn is a name synonymous with bikes. Founded by the German-born Ignaz Schwinn, a mechanical engineer, and his partner Adolph Fredrick William Arnold in 1895, the Arnold, Schwinn & Company struck while the iron was hot and started production when bikes where huge in America. But their big boom didn’t come until the 1950s and 1960s, when, thanks to a solid product and innovative marketing, Schwinn became a household name and Schwinn bikes could be seen on nearly every street in the USA. Back then, any kid who depended on two wheels only wanted one brand – a Schwinn! These Schwinn lamps feature awesome, unique designs, and are a great way to add a retro and sporty touch to the room – I see them working well in the garage, game room and kids’ room. The shades feature true wraparound designs, so there’s no bad angle for display. Part of a retro-style collection of table and desk lighting, the Schwinn designer lamps are made in the USA, each lamp has a stylish, brushed nickel base and a classic on/off pull chain. If you remember tearing up the sidewalks in the ’60s, you probably recognize the bike featured on the Krate lamps. The Krate was first introduced in 1963 and was inspired by motorcycles of the day. A prized possession of any boy or girl in the ’60s, the instantly-recognizable Schwinn Krate Bicycle featured high handlebars and a banana seat. The Schwinn Krate lamp features a repeat pattern of the classic banana-seat bicycle. It’s available in pink or avocado. The Schwinn Krate lamp in avocado. 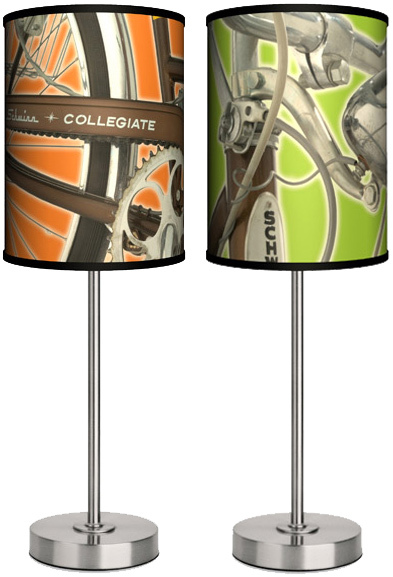 The Collegiate and the Varsity lamps celebrate popular models from the ’50s and ’60s. Both of these cool lamps feature a close-up view of these classic bikes. The Collegiate shows the rear tire and logo, while the Varsity showcases cool, curved handlebars and the iconic Schwinn oval nameplate. Or you can zoom in even closer with the Schwinn Handlebars Desk Lamp that sports an up-close and personal view of the Schwinn logo, handlebars, and a headlight! Do you remember traversing the neighborhood in a Schwinn when you were growing up? Did you own a Krate, Varsity, or Collegiate? I’d love to hear about your first Schwinn.